Simmer the pumpkin in water until very soft. Drain and puree with a blender or food processor to make a pumpkin puree. Next, whisk the flour, sugar, baking powder, spices and salt in a bowl. In separate bowl whisk together milk, pumpkin puree, melted butter, and egg. Spray or grease a skillet and heat over medium heat: pour in ¼ cup batter for each pancake. Cook pancakes for approx 3 minutes, until the edges bubble and they are golden brown, flip and cook for another 3 minutes. In a sauce pot, slowly render the bacon over medium heat. Once the bacon is a little bit crispy, scoop it out with a spoon and place in a quart sized mason jar. Add the diced onion to the bacon fat and cook over medium heat. Stir with a wooden spoon, scraping the bottom and sides to remove any fond. Cook until the onions are about 50 percent done, you don’t want them very soft. Add the jalapeños, cook for 1 minute, so as they remain bright green. Pour in the Bourbon and cook down until it’s almost gone. Add the onion jalapeño mix to the bacon in the jar. 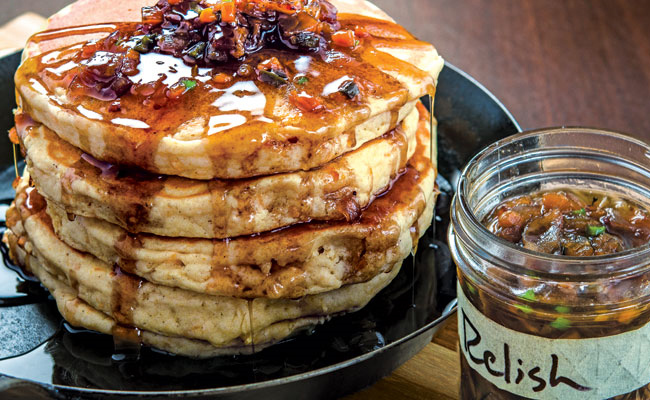 Stack the pancakes on a plate, top with the relish and drizzle with any remaining syrup.